I have 7 years of experience working with newborns and know you should always expect the unexpected. I will work within what baby is happy doing, which sometimes means that baby may need more time to eat, cuddle. A newborn led session means that I will always take baby into consideration when it comes to posing and let him/her decide what they’re happiest doing and follow their lead. A newborn session can take a few hours to allow me to meet the needs of your baby, The addition of a new baby to your family is one that everyone should celebrate, so not only do I capture timeless images of your sweet baby, I also capture the love and adoration of parents and siblings. I also know how incredibly important these images are to us parents. This is a time in our sweet little ones lives that we just can't get back. I also know how much of a financial strain this can be and I want to make it as easy, and affordable, as possible for you. Contact me today to find out about payment plans! With 4 kids, I have to find every way I possibly can to make our dollar go as far as possible. The financial strain of raising kids today is unreal! I’m here to tell you that I get it 100%, and not only do I get it but I want to extend some savings to you, to make it easier on your wallet and get precious memories of your sweet baby. Here’s the deal, I want to make it possible for you to have it all AND save money. 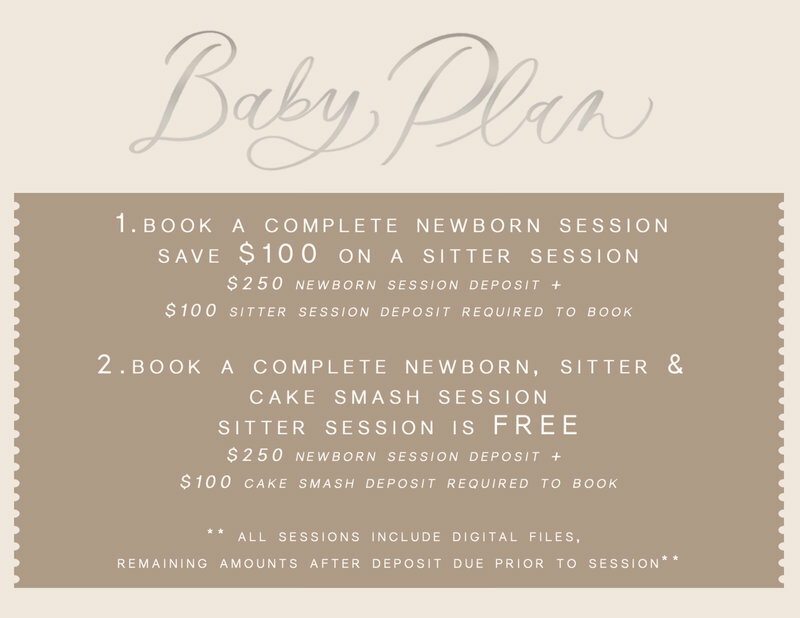 I’ve decided to implement a baby plan so that you can have every session you want in the first year of baby’s life and not miss out on a single milestone. The more sessions you book, the more money you save! interested in learning from ally?